Skellig Islands – Here is why you have to visit! Ireland’s islands are worlds unto themselves and none more so than the history-rich, natural wonders that are the Skelligs. Off the coast of County Kerry, two jagged islands rise out of the Atlantic Ocean – ruggedly beautiful with centuries of history hewn into their very rock. These are the Skelligs – Skellig Michael and Little Skellig. 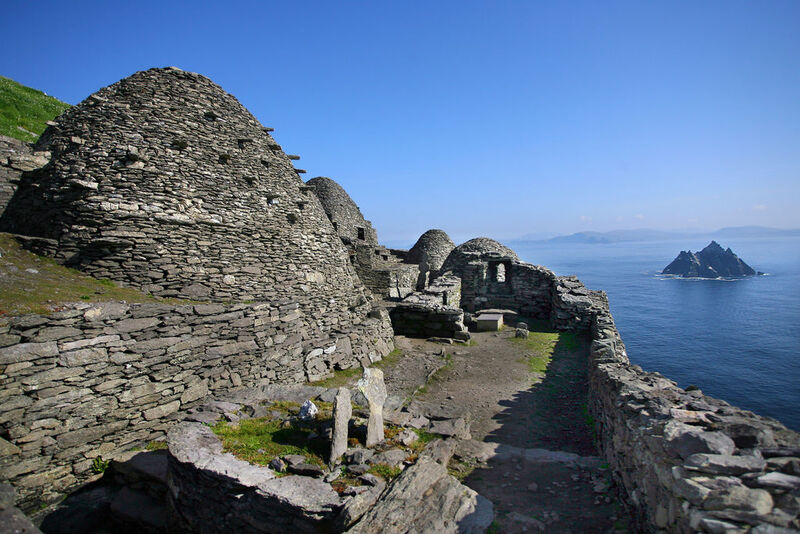 Thanks to its recent appearance in Star Wars: The Force Awakens, Skellig Michael has become a star of the Wild Atlantic Way, attracting visitors keen to stand in the other-worldly place that Luke Skywalker made his hideout. Yet the island and its sister were world famous long before the Jedi discovered them, because of their significant archaeological and ornithological importance. Skellig Michael, a UNESCO World Heritage Site, was chosen by sixth-century monks as the location for their monastery, and their stone-built, beehive homes reached by climbing 600 steps are a wonder to behold. Tour guides on the island offer insights into the history, mythology and wildlife on the island, telling tales of Viking raids and epic battles. Little Skellig is renowned as the home of the second largest colony of gannets in the world and both islands also have thriving colonies of puffins, artic terns, Manx shearwater, fulmar, cormorants and guillemots. The islands can be reached by boat from Portmagee, Ballinskelligs and Caherdaniel, and although landing is not permitted on Little Skellig, great views of the island can be had from the water. The trips are weather dependent, so if the wild Atlantic prevents a crossing, the next best thing is to head to the Skellig Experience on Valentia Island. Housed in an award-winning, grass-roofed, stone building the Skellig Experience has four exhibitions: the history and archaeology of Skellig Michael’s Early Christian monastery; the sea birds; the lighthouses; and underwater Skellig, as well as a film presentation entitled ‘An Island on the Edge of the World’. As part of an island-hopping adventure or as a stop along the spectacular Wild Atlantic Way touring route, a visit to the Skelligs is a chance to experience something truly elemental, to step outside the ordinary and to stand for a moment on the edge of the world.